Deborah Newton creates exceptional detail in her work, and has created many beautiful designs out of Koigu Wool. In Koigu Magazine 9 Deborah created the Lace Pullover (In KPM) and the Cabled Cardigan (In Chelsea) - photos below! 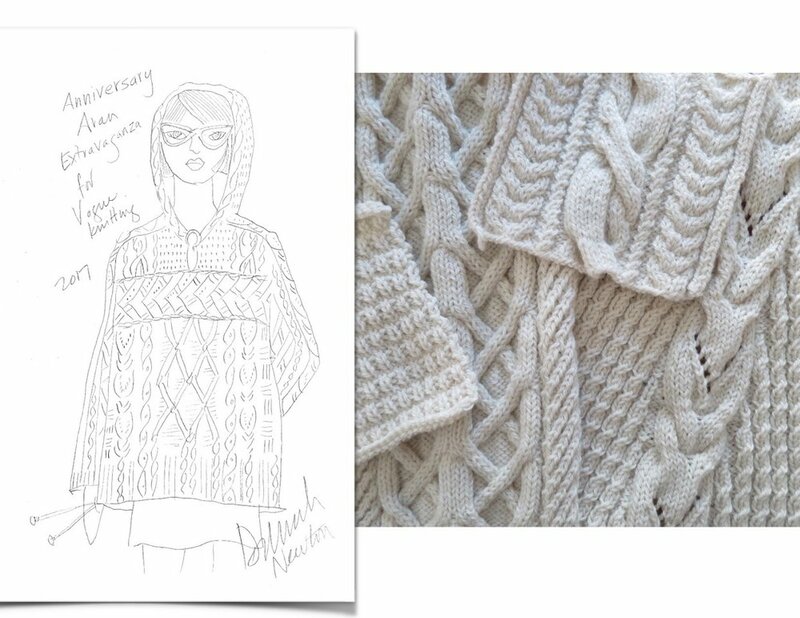 Read more on Deborah’s design inspirations, why she loves scandinavian designs and her favourite reasons to knit! In the afternoons I do all my freelance design work, and I have often worked on book projects over the years. My husband Paul Di Filippo is a writer so we are in sync, both freelancers, doing work from home with deadlines and all that entails. I have a lovable 3 year old black-and-tan cocker spaniel named Moxie, and a grouchy calico cat named Penny. My beautiful city is very walkable! And Rhode Island has such lovely coastline, and I grew up swimming in the ocean, something I love. I could never give that up if I had to live somewhere else. I love to garden here in the city, and I grow vegetables, flowers and many roses. How did you begin knitting? I have been knitting since I was a little girl: I was about 8 years old when I started. My mother had a large bin of needles and a few balls of yarn. I was totally fascinated! My mother taught me the basic knit stitch. I have to admit I knitted only garter stitch squares for over 10 years, until I was in college. Then, in my early 20s I discovered Barbara Walker’s books about stitch patterns and I started to learn how to purl and knit other more interesting things! Growing up, my Swedish mother had made a red snowflake sweater with skiers and pine trees on it, and I loved it so much. Even when I was about 6 years old, I wore it around the house with the sleeves rolled up and it was like a dress. I like to think that sweater, my mother’s work, inspired me in some way to become a professional designer. I have taught myself to crochet, and I love it, but I do not do much of it. I would like to do more, but most of the designing I do is for knitwear. How many years have you been knitting? I have been professionally knitting, designing and writing knitting books for over 30 years. I also sew, have made quilts and embroidered, and I had a loom for a long time, all just for pleasure. How has knitting impacted you? I feel that knitting has been very good to me, in many ways. First of all, I was able to work at home with Paul, and we have enjoyed that for decades! Secondly, knitting has been a creative vehicle for me to pursue my interest in clothing. So over the years, I have learned a lot about how to shape knitted garments of all kinds. I have also been interested in the topic of good fit, and have worked hard to present it to other knitters in workshops and my book GOOD MEASURE: KNIT A PERFECT FIT EVERY TIME. Last, but not least, I have really enjoyed being part of the knitting community. I have met and made so many good frienda through my work. And I love being in touch with knitters and helping them with questions and design ideas. I love the stitch I am working on at the moment! I do love combining different kinds of stitches to come up with new pattern stitches. And I love working with color— I teach a workshop about Scandinavian knitting patterns which are often very whimsical, and that appeals to me. Maybe that interest came from my mother’s ski sweater with all its motifs! It is very hard to single out any one person since our industry is so full of talented designers— and I love to see all that people are doing. And due to the consecutiveness of the world today, we all get to see so many new designers who are devising new ways of working with knitting! It is fabulous. I have to say I have always admired Kaffe Fassett's ability to design in more than one venue at a time— knitting, fabrics, quilting, painting. He is truly a Renaissance man! Over the years I have designed for many yarn companies and magazines, as well as designed fabrics for 7th Avenue garment industry. And I have included my designs in all the books I have written about designing, finishing and fit. I almost always knit at my desk. I rarely knit anywhere else, which is often surprising to other knitters. Being at my desk, in my little office, is the place where I can be most focused and juggle many projects at the same time. Whats your favourite project you’ve made? It is hard to say— I have designed thousands of sweaters and fabrics over the years! 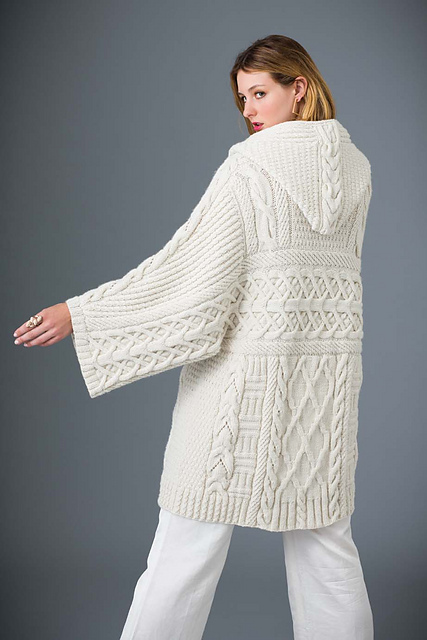 But for the 35th anniversary issue of Vogue Knitting, I desiged a cabled pullover with a hood that was featured on the cover. It was made in sections that were picked up from a central horizontal cable, in a directional way I had never tried before. So that was a lot of fun— both the construction and working with a wide variety of cable and texture stitches. Koigu vest from Early Fall Vogue Knitting 2013— shot in my dining room! Any other form of crafting which interests you? I would love to learn more about crochet and how to use it for garments and accessories. Right now I am really enjoying working on three sweaters in beautiful Koigu yarns! First, a coat knitted with a combination of knit and purl textured patterns, in luxurious heavyweight Othello. Second, a lace-accented raglan in Kersti yarn, which is a joy to knit both for the yarn and the color! This sweater has an uneven hem and a lace and cable pattern of my own design. Third is a lightweight cardigan that combines lace and stranded colorwork in the lovely Koigu KPM, one of my favorite yarns. I am also working on a very special ensemble for the Fall 2018 issue of Vogue Knitting— a sweater and accessories! I started to teach in earnest about 10 years ago, presenting all knitting topics that interested me, and topics that went along with my books. At first I felt like an imposter, since I had never taught before! But as time’s gone by, I’ve come to truly love sharing my skills and ideas with other knitters— it is so rich for me to get together and share. I love to teach! I teach workshops at almost all the VK LIVE events, as well as travel to guilds and yarn shops. I also teach a wonderful 4-day Knitwear Design Workshop every year, on Block Island, off the coast of my state of Rhode Island. I love to help budding designers to understand all the aspects of how to design and write a pattern! I teach a lot of classes about knitting for good fit— how to measure, read a pattern to choose the right size, and all about garment shapes and how they differ from each other. I also ADORE finishing, so I like to share my tricks to make it easier. And teaching design is what I love best— sharing my experience to help people pull all their ideas together in an effective way. The future is always exciting for me! What will I be designing and in what yarns? Will I wirte a new book about another knitting topic? Where will I teach next? Who will be my new students? I am never bored and consider myself blessed in many ways— both for my career and the ability to share my experience with other knitters.